Each finished job offers a lot of information to be tracked. Map – on the map you can see the job execution as the actual travel from a start point to an end point highlighting the stop points (tasks). Maximizing the map you can see the very details of the travel asssociated with the job. Green marker shows the current position of the driver. As the first marker of the route we see the event where and where driver accepted the job, then there is the route he took with the locations of his task along with the details (e.g. signature). Also the events where the driver posted a message are marked on the map. By minimizing the map you get back to job details. Task list with their details including the status, which will be mostly marked with the status icon Done. However, it is possible to finish the job without completing all the tasks. Barcodes – each task displays the lists of sucessfully scanned barcodes proving the customer received the goods properly. Payment – where the payment has been made, you can see the information about the amount and type of the payment. History – at the bottom we see the history of all operations and status changes occured with the job starting from creation of the job by a dispatcher to its closing by a driver. We can see all the messaging exchanged between parties together with various pictures attachments. All this information about the job stays in the system database and can be retrieved at any time. When in Jobs list, you can switch between three views – standard Job List, Map and Scheduler. Click the Map pin icon to switch to map view. 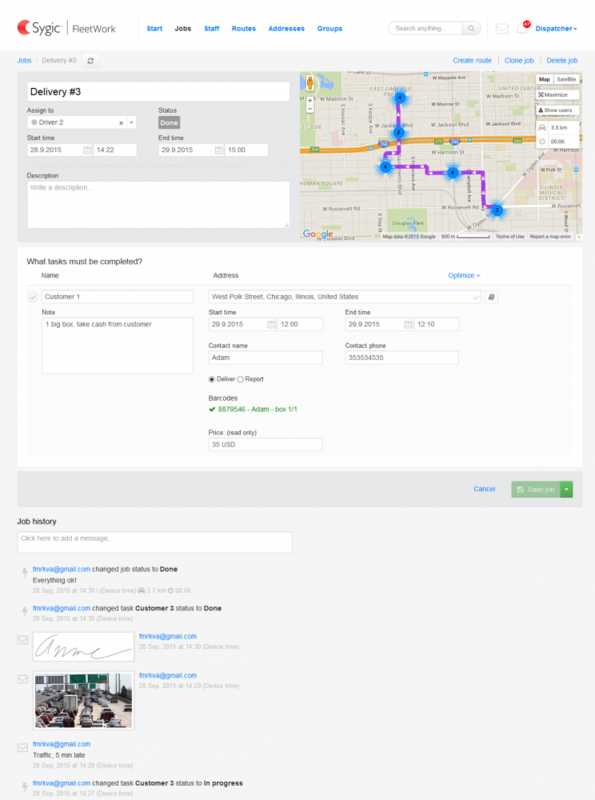 You will see filtered jobs and users in realtime in specified time period on map.